It's hard to say you're Italian when you don't look Italian. I guess it's the same when you get questioning looks because you look like you just stepped off Scandinavia when you proclaim that you are Asian. But I am used to it. I know that pause perfectly well when I say that I am from Italy. I take it as my cue to explain why I am Italian when I look like I just landed from Asia. I have been here for 17 years (God, has it been that long? ), took my oath of allegiance to the Italian flag long before my kids were born and well, started my new roots here. New roots, new country, new life. That was half a lifetime ago. Depending on my mood, I see it as a plus or a minus as to how I should approach myself. My husband reminds me that having two cultures inside me gives me a wider stance on different aspects of life. One aspect that I am putting a plus on is life in the kitchen. I learned from the experts in the family kitchen, the ones whom my kids call Nonna (Grandma) with other two women whom they call Zia (Aunt) No.1 and Zia No. 2. Yes, lucky me, I had three Sicilian women who took me in their arms and led me to their kitchens and tables. You see, Italian food chatter happens before cooking, while cooking, after cooking and even in the streets with strangers. Everyone speaks about the best way to cook certain dishes and about healthy eating. And these food talks start as soon as they are born (when they start speaking). Don't be surprised if I tell you that both of my kids' first communications pertained to (you guessed it) food. 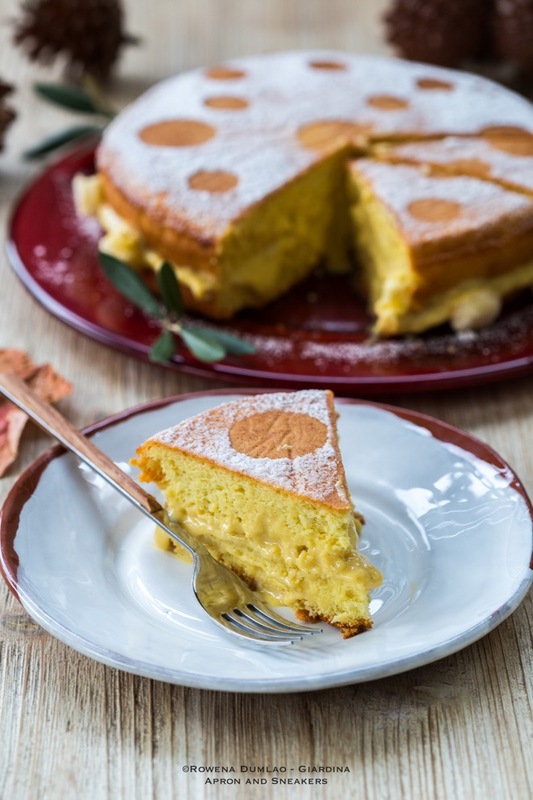 Pan di spagna (sponge cake) is the most classic of the classics. It's one of the first things I had to learn because it is fundamental for every Italian. If you are having kids, learn it. It's a must. Your kids cannot grow up without having them at home. When kids eat them as snacks, just sprinkle some icing sugar on top, slice then eat (most often with the hands). 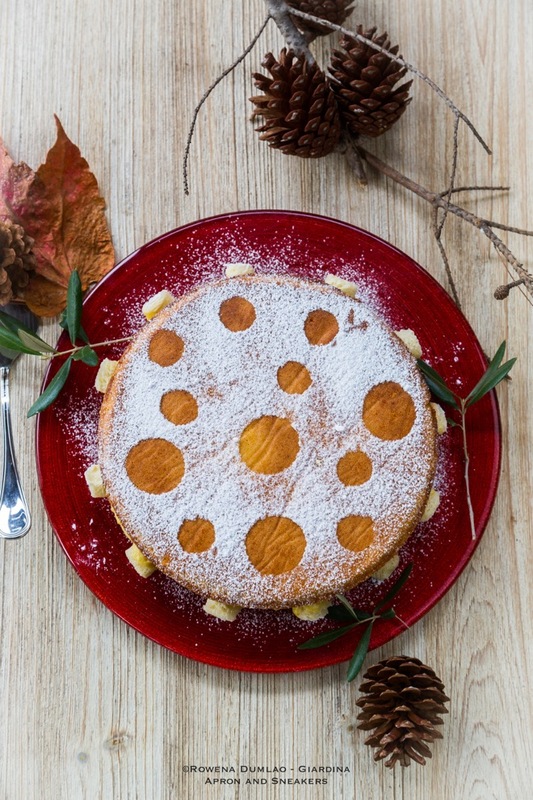 Pan di spagna is also a common base for a cake. 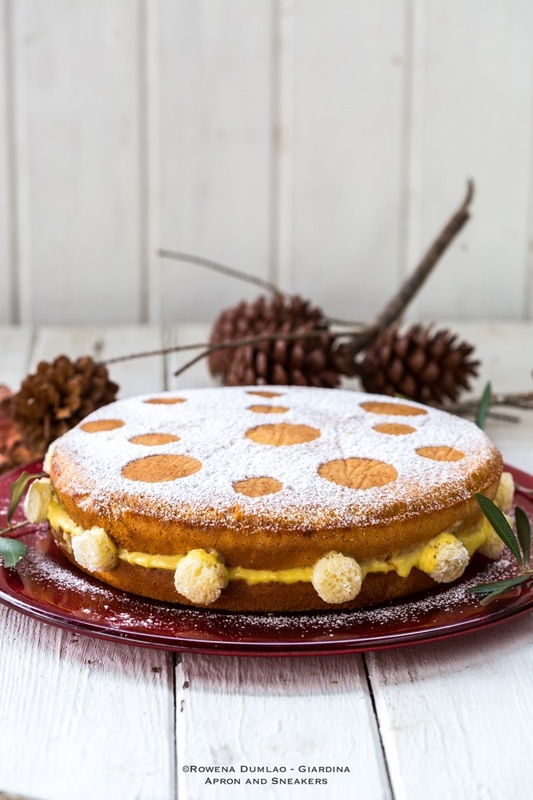 Usually, the cake is sliced in the middle then it is filled with crema pasticcera (pastry cream) then icing sugar is sprinkled on top giving it a snowy look. Usually. 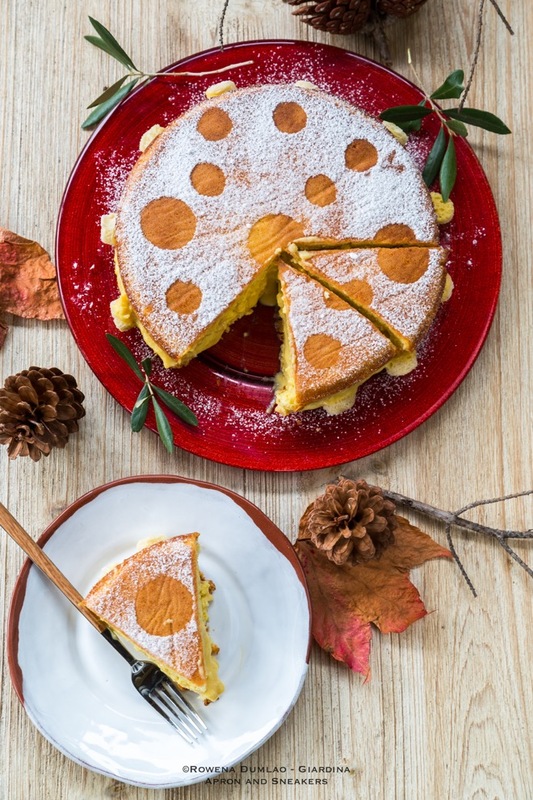 There are a lot of other ways to dress up the pan di spagna. I remember my mother-in-law filling it up with mandarin cream when she has a bottle of mandarin concentrate from Sicily available at home. Sometimes she would add different kinds of fruits or chocolate cream. I loved her version of mixed fruits and mandarin cream. Recipes are handed down through generations then modified again and again. Everyone learns a better way by tweaking here and there as they keep on baking. My own mother-in-law has about five in her recipe book, I have a number of different ones too and so are the rest of the people I know. 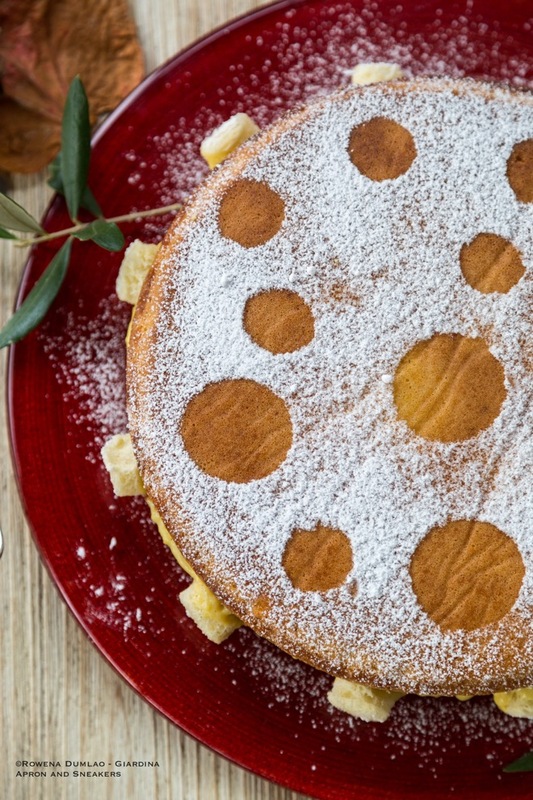 Here is a simple one that yields a satisfying soft and spongy cake. 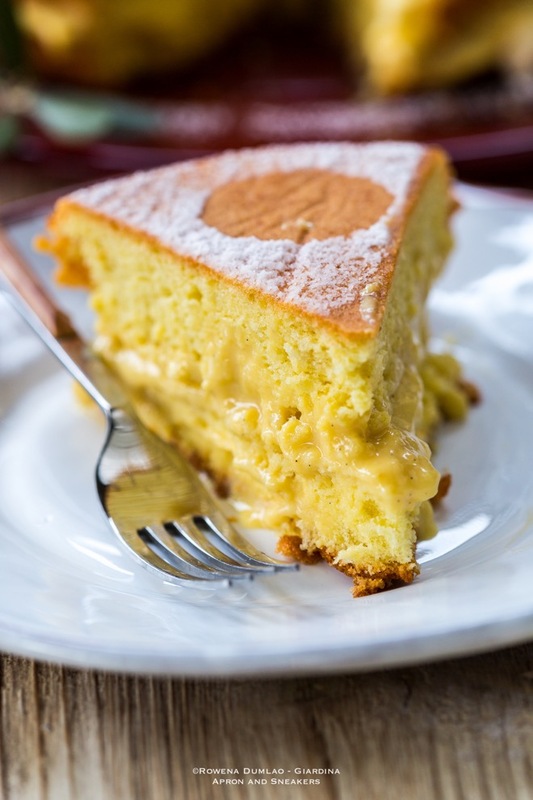 For the full recipe of my Pan di Spagna con Crema Pasticcera (Italian Sponge Cake with Pastry Cream), you can get it at She Knows, a site where I create recipes. For more of my recipes, you can check out my Profile Page there. Buon appetito!